Ok, this is my second post for the day so make sure you scroll down and catch both posts. 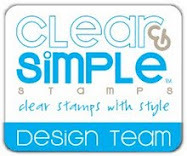 Each month fellow Clear and Simple Stamps design team member Sue Berker designs a wonderful template to share. She's come up with yet another wonderful template for you this month. Here is my version of the Trick-or-Treat Basket. Insted of going with the traditional orange pumpkin/black face I thought I would try creating something with a more vintage feel to it. The flowers are some silk flowers that I bought from Michael's and pulled off the stem. The green twists are just thin strips of Kiwi Kiss paper wrapped around the metal ends of my embossing tool. I added an extra strip of kraft cardstock around the top of my basket just to blend with the kraft handle. I was afraid that the contents of the basket would spill out the sides so I made a liner for my basket by cutting a piece of transparency, putting a strip of scor-tape down one end and rolling it into a tube. The candy corn was them poured inside the tube. 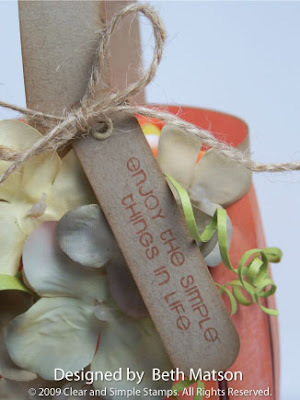 The basket is made with SU Tangerine Tango cardstock that has been rubbed with a variety of ink pads to create a weathered look. I decided the basket really need a tag so I stamped a message from the Live Life set and tied it to the handle with some twine. Please be sure to visit each of the Design Team members blogs (links on the right) for their samples of the Trick-or-Treat basket. 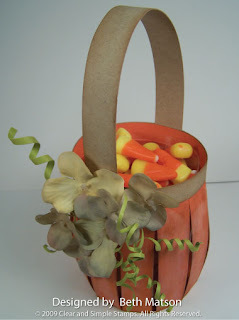 Don't forget to join us and upload your basket to our group on PaperCraft Planet. Awesome! I'm going to have to try this! Beth, you did such a lovely, lovely job on this. I totally love it. 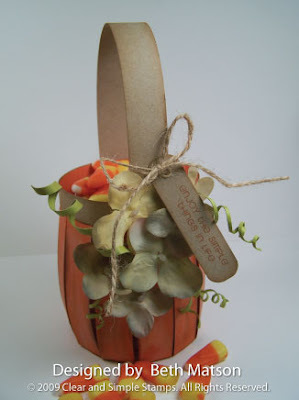 Gorgeous template, I love how you added the leaves & little twirleis.